1 of 3 Heat oven to 200 degrees . In a skillet, heat oil over medium heat. Stir in onion; cook 3 minutes. Add garlic, chili powder, cumin and 1/8 tsp of the salt; cook another 2 minutes. Stir in beans and broth; bring to a simmer and cook 3 minutes. Smash half the beans with the back of a fork and stir. 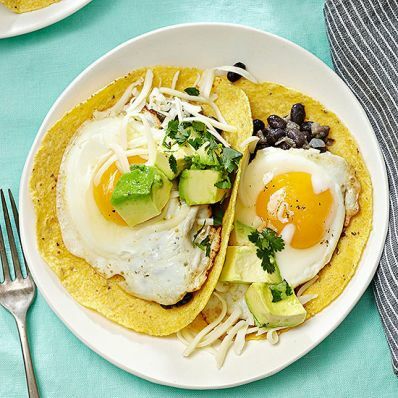 Place tortillas on a baking sheet and spread 2 tbsp of the beans on each tortilla. Place in a 200 degrees oven. 2 of 3 Wipe out skillet, then add 1 tbsp of the butter. Fry 4 of the eggs 2 minutes, until cooked. Transfer to tortillas in oven. Add remaining 1 tbsp butter and repeat with remaining 4 eggs. 3 of 3 Remove tortillas from oven, season with remaining 1/8 tsp salt and top each with 1 tbsp Monterey Jack. Garnish with avocado, salsa and cilantro, if using. Per Serving: 702 mg sodium, 25 g pro., 7 g sat. fat, 436 mg chol., 10 g fiber, 41 g carb., 20 g Fat, total, 444 kcal cal.